I have had my Motorola Droid for about 7 months now, and I absolutely love it! I love how customizable it is and how you can do with it what you want. Another awesome feature of it is the apps. I have found over 100 apps that I have installed and use on a daily basis. One such app is LDS Scriptures App. I first downloaded this app back in January, and I have to say it is probably one of the most used apps on my Droid. You can go to their webpage for all of the features, but one that I love and use the most is the ability to synchronize with their servers. That means that anytime you reinstall the app (which I do plenty of after changing different ROMs on my Droid), your notes, highlights, bookmarks, tags, etc. are all restored within minutes. Another advantage of syncing with their servers is that you can choose what content is on your phone. They have a list of literally hundreds of books, manuals, and resources that you can get to your phone in no time. Probably the coolest feature that this app has, however, is the ability to create custom content. I have found a few things that I wanted quick and easy access to, so I just created a book using their book builder, and it showed up on my Droid. Piece of cake! Now, this app is not perfect. However, I must say that it has improved a lot since I first got it. The links to other books are far more accurate than they used to be. I have noticed that I will have to attempt to open books from My Content a few times before it is successful. But those are minor annoyances with an otherwise excellent app. This app is available for Android, iPhone, iPad, PC, and Mac. I would highly recommend it! Well, I guess it's about time that I post an entry about our new son, Travis. He was born on April 1st. We had some mixed feelings about our son being born on April Fool's Day, but in the end, we decided it would be a fun birthday. Anyway, after the epidural, the waiting game began, which didn't last as long as we thought it might. By about 1:00, the nurse said that she was going to call the doctor to have him come in because it was time to push. They started prepping the room and getting everything ready. The doctor got there at about 1:15, got prepped and Stacey started pushing at 1:27. 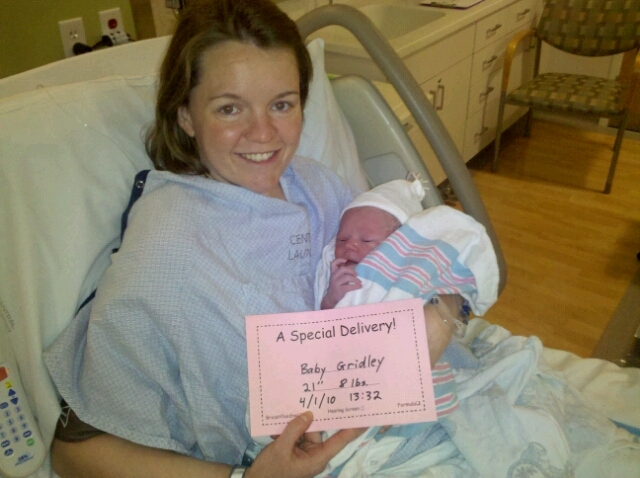 Travis was born at 1:32, only 5 minutes of pushing - way to go, Stacey! He was 21 inches long and weighed 8 pounds even. Since it was April Fool's Day, we decided to try and pull a little trick. We asked the nurse if we could get one of those cards they put in the crib, but a pink one. She gave us one, so we sent out this picture along with the caption "Here SHE is! Now we have to think of a girl name!" We had some people fall for the trick. However, both of our parents didn't fall for it, I guess they know us too well. It was funny to see some of the comments from people who did think we were serious. That was the first of many April Fool's pranks throughout his life! Travis did so well. I think it was the quickest and easiest delivery of all 4 of our children. They did all the routine checks, and Travis was just perfect. The only test that was a little questionable was the bilirubin test. His levels were slightly higher than they should be. We were nervous that we were going to have to have Travis on the light bed or blanket like we did both Aaron and Nathan. However, we went to the clinic twice over the next weekend, and his levels went down, so there wasn't a need for the lights, whew! Kaylee, Aaron, & Nathan absolutely love Travis. They are so cute with him. We were a little concerned about Nathan, that he might be jealous or be a little rough with him like he is with our dog and sometimes his cousin, Izy. However, Nathan is extremely gentle and tenderly pats his head and gives little kisses on the head, cheek, leg, wherever he can reach. Stacey is also doing extremely well and had a very nice recovery. She was able to get up and walk around on her own the same night as the delivery. We were able to go home from the hospital just a day after the delivery. I am amazed at what a strong woman she is - not even child birth can keep her down! We are very excited to have Travis in our family. We love him so much. Aaron, the first time he was holding Travis at home, said to Stacey, "Mom, I've only known him a few hours, but I already love him so much!" We all shared that feeling. It's amazing that we can love him so much so quickly. Stacey is so cute with Travis. I love watching her interact with him. What a cute mother! I have uploaded an entire album of pictures of Travis both at the hospital and at home with the family. You can view that album here. We also want to thank everyone for the well wishes and help that we received both before and after Travis was born. We love our friends and family. 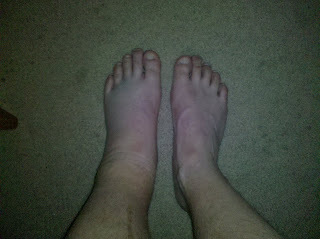 Three weeks ago, I was playing a game of pick-up basketball. I was in the key waiting for a rebound. The rebound was behind me and a little to the left, so as I jumped it forced me to be off balance a little bit. 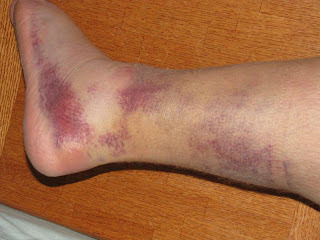 Anyway, I came down right on top of someone's foot and rolled my ankle outwards. Because I was off balance, my right foot was up in the air and didn't give me any support, so all of my weight was on my left ankle. I heard 3 pops and knew something was immediately wrong. Needless to say, my night of basketball was done. I went home and Stacey helped me wrap it with an ice-pack. I took about 16 ibuprofen (maybe not quite that many), and tried to sleep. At about 2:00 in the morning, I woke up from the pain. It was so bad, I just could not sleep. I got up to go get a drink, and as I was hopping over to the bathroom, I started to feel a little light headed, so I sat down. This commotion woke up Stacey and she asked me if I was OK. I said, "I feel like I'm going to throw up and I don't think I'm going to make it to the bathroom, you better grab the throw up bucket." (Every family has a throw up bucket, right?) Anyway, as I was sitting there, my head started spinning and I felt like I was going to pass out. Stacey told me to lay down on the bed, which I did. Almost instantly I felt better. It was a very weird experience. That week, I was working the early shift at work (4:30 AM - 1:00 PM). I was originally planning to go to work at 4:30, but then at 7:00 when other people started showing up, leaving to go to the doctor. However, after that experience, I knew that I wasn't going to be able to drive to work, or at least I didn't dare do it. I waited until about 3:15 and then called my boss and told him what had happened. Luckily he was very understanding and willing to help me out that day. I have the best boss! Later that morning, I called and got an appointment to go see the doctor. All morning, though, the pain was so bad and I could not find any position to make it better. 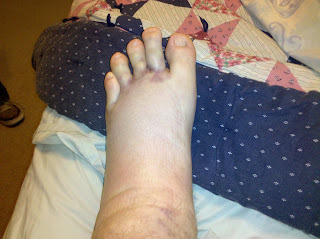 By the time we got to the doctor, I was convinced that I had broken my ankle. It had swollen so bad, probably to the size of a grapefruit. 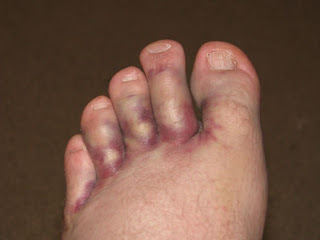 The doctor took some x-rays, and then came back and told me that it was not broken, just a severe sprain. 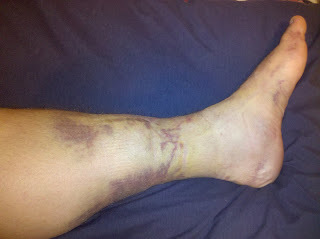 He said that I probably tore some ligaments as well. Anyway, over the last 3 weeks, I have been recovering. 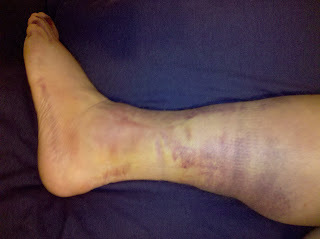 The first week, I was in a boot, then I went to just a lace-up brace. I am to the point now that I can walk without any support, but my motion is definitely restricted. You can see how much bigger it is than my right. 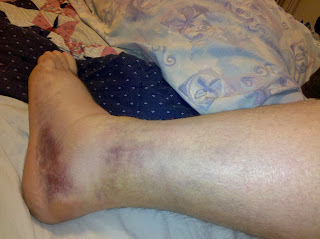 Anyway, I have been icing my ankle as much as I can the last 3 weeks. One thing the doctor told me is to stick my foot in an ice bath. I had never done that before. I tried it about a week ago, and I was amazed at how painful that was for the first 5 minutes. After that, my few numbed up, all except for my toes, they were tingly and painful the entire 20 minutes that I did it. 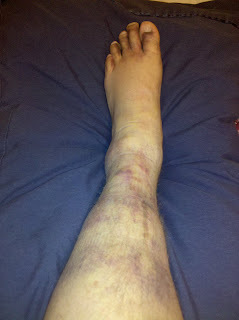 I really hope to be able to go play some basketball this week and maybe be back to full strength soon. We'll see, though. The last two weekends I was up at Camp Tracy in Millcreek Canyon for Wood Badge. To be honest, as I was packing the first Wednesday, I was not terribly excited and was pretty anxious as I didn't know what to expect. As I got there and went through the orientation and met my patrol, I still wasn't quite sure what to think about it. Those people who know me know that I am pretty reserved and it takes a while for me to warm up to new people. Anyway, I think that is the reason that by the end of Thursday, I still wasn't quite comfortable and wasn't enjoying Wood Badge that much. I called Stacey that night and expressed those feelings to her. However, over the course of the Friday activities, something must have changed, and I don't even know exactly what it was that changed my attitude. Friday night, I was feeling much more comfortable with my patrol and was enjoying Wood Badge so much more. By the time Saturday was over, I was kind of sad about leaving. The next Wednesday when I was packing and getting ready to go back, Stacey said to me "You're excited to go back, aren't you?" I said "Heck Yeah!" The second weekend up at Wood Badge was awesome. There were a lot of team building activities, and we had so much fun and learned so much. The beauty of Wood Badge is that not only do you go and learn all the great lessons, skills, etc. But then you come back and apply it by "working your ticket." It gives you the opportunity to apply the lessons that you learned and to help improve not only yourself but your family, scout group, work life because of what you choose to work on. Another thing that was so amazing was our patrol. We were quite different in personality and abilities, but we came together so well. I was truly sad to say goodbye to them and am looking forward for when we can get together again. We were the Bear Patrol, so we each came up with bear nicknames for each other. Friday night we had our campfire. We had a good sized fire, and we just sat around the fire talking until about 11:30 at night, at which point 3 of our patrol went to bed. The other 4 of us stayed up until almost 1:00 AM, then finally decided to go to bed. What a fun night of talking and getting to know and understand each member of the patrol even more. That definitely helped our patrol grow even closer together. I would recommend Wood Badge to anyone. There are a lot of Scouters that I serve with who haven't gone, and I want to get as many as I can to go. Wood Badge is hard to explain why it is so awesome, it's something that you just have to experience for yourself. What an opportunity to develop your knowledge, skills, and an amazing relationship with other Scouters. If you have gone to Wood Badge and have anything to add, please do so in the comments. Well, Stacey and I had made a goal this year to do a triathlon together. Stacey hadn't done one before, so we found a smaller one and decided to do it. Last Saturday, we did the Bountiful Triathlon at the South Davis Recreation Center. The distances were Run: 3.25 Miles, Bike: 10 Miles, Swim: 350 Yards. My training this year has not been nearly as good as last year. I think I lost some of my motivation. When we went to Steamboat Springs, neither of us exercised at all and we did not eat good at all either. Combine those two and it is difficult to be ready for a triathlon a week later. I decided that if I was going to do the triathlon, I better at least train hard the week before. So I went on a couple of runs and swims and a bike ride the week before. The weather forecast for the race predicted rain. I was not excited at all about that. When we got there and were getting set up, it was raining pretty good. However, once the race started at 8:42, the rain had stopped and the weather was good from there on. This triathlon had the run first, so that they could start everyone at the same time and not have to worry about separate waves in the pool. I have mixed feelings about that. Lately, my left knee has been hurting me when I run, so I was kind of glad to get that out of the way. But I think one of the reasons that the swim is first is because it requires the most preparation. I started off the run fast, passing a lot of people. I think it is just my way of trying to get out of the crowd. I don't like the huge crowd at the start of races. However I think I started too fast and I could feel the effect of not running much recently as people were passing me quite a bit near the middle/end of the race. I was very glad to have the run over with. The bike was what I was looking forward too. I started off quick, and sure felt good as I was able to pass a lot of the people who had passed me during the run. In fact, I figured out that I passed a total of 63 people while not getting passed by anyone (2 relay teams passed me, but I don't count those - they didn't have to run). The bike leg sure did seem to go by very quickly, though it took longer than the run. I got back from the bike, ran to my transition area, tore off my shirt, shoes and socks and started running towards the swim. It wasn't until I got to the pool that I realized that I had forgotten my goggles. Crap! I decided that it would take longer to run back and get them than to just swim without, so I dove in. Their plan to spread people out using the run and bike only worked to some degree. There were still a lot of people in the pool and I kept bumping in to people and hitting people, probably more so because I couldn't see. Despite the fact that I was swimming without goggles, I was mostly pleased with the swim. The week before the triathlon, I had to do quite a bit of convincing to get Stacey to even compete. Due to Steamboat Springs, she did not feel ready. However, she did it and is glad she did. She was most nervous about the swim, and was nervous that she would come in last in the entire race. I assured her that she would not come in last and that she would be able to complete the swim, just to take it at her own pace, and if she needed to rest for a bit, do so. She ended up 298th out of 370 overall and 36th in her division of 49. She was pleased with her time as her goal was 1:40. However, she wishes that she had gone a little faster on the run or perhaps one of the transitions so that she could have gotten under 1:30. For her first one ever, I think she did a great job. Like I told her before the race, "For your first one, it doesn't matter how you place, but that you finish," which she did. I am very proud of her and hope that the triathlon bug hits her and she works towards doing another one. All in all, it was a good race, and a great course with one exception. The road where the bikers left and returned had to be crossed by everyone coming out of the transition area running to the swim. I heard that there were quite a few close encounters and even a few crashes due to this. They should have planned that a little better and perhaps had the transition area located somewhere else. My one complaint about the organization of the triathlon was the transition area. We got there at about 7:30, and asked how the tranisition area was organized (by number, by category). We were told that it was not organized at all, that you just grabbed a spot. Looking around, there was not a lot of empty spots, because people had taken up so much space. They should have done that better. Also, the transition area had very little security. Anyone could walk in and out as they pleased. Luckily, I didn't have anything stolen, but it could have been without much opposition. I am motivated now to train even harder and work towards improving. I guess I just needed a little competition to wet my appetite. 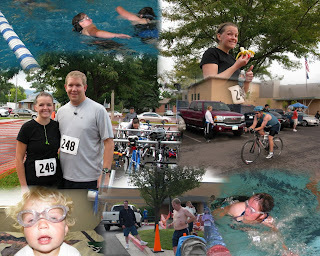 Here are some of the pictures that we took (and my mom took) of the triathlon as well as our future triathlete!